By virtue of where I live and the routes I take home, passing by North Burnaby Wonton House is inevitable. Every time, I take a look and ponder. Was I too hard on the place? I blogged about it a long time ago and let's just say I wasn't very nice. So 3 years have passed and I still wonder. I promised myself that I would give it another shot. I thought it would happen sooner than later, but with so many tasty eats in town, I really didn't have the time for it. Until now. Still recovering from a nasty bought of the flu and with Viv coming down with it herself, it looked like a night of McD's... 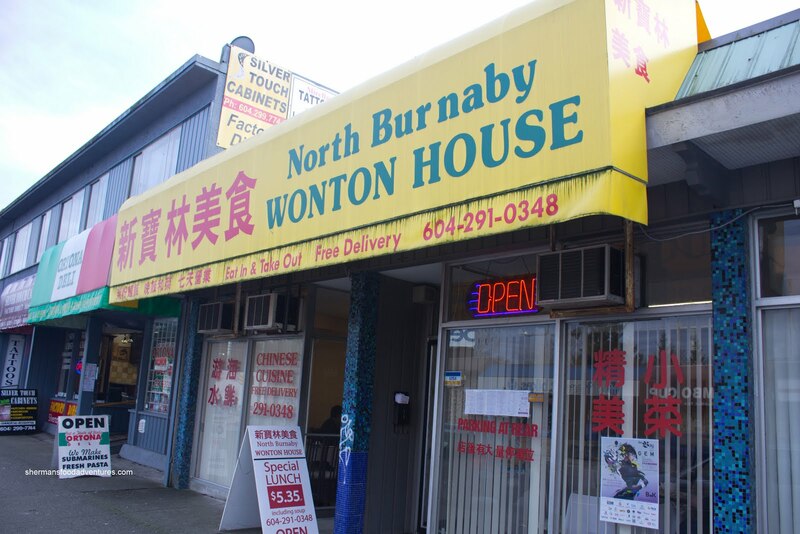 Wait, why not do take out from Nor th Burnaby Wonton House instead? So I dialed them up and put in an order for pickup. I took the quick jaunt over there and when I was presented with my food, it looked like it could feed an army. For $38.00, this Dinner for 4 seemed like a really good value. 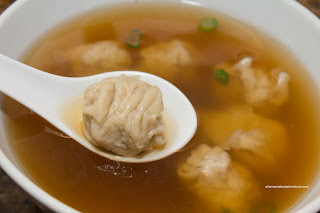 Included in the meal was Wonton Soup to start (12 wontons in all). Okay, the first time I visited NBWH, my bone of contention was that they couldn't possibly put "wonton" in their name if they had mediocre wontons. Well, not much has changed. These all-po rk wontons were slightly dense and far too meaty. At the very least, the broth was tasty, if not salty. 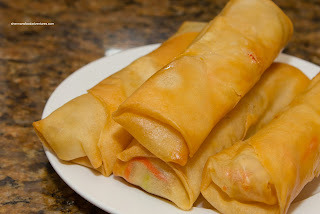 Now any North Americanized Chinese food isn't complete without Spring Rolls right? We got one each of these cabbage and carrot filled fried cylinders. These were actually very greasy and could've stood for a quick drain or soak from a paper towel first. They were crunchy though and the filling was crisp and decently seasoned. 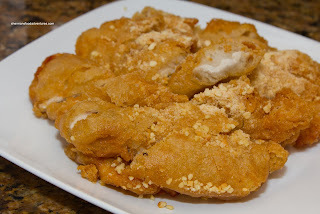 Then a dish I would never order if it weren't included - Almond Chicken. As you can clearly see in the picture, the thin sliver of chicken represents only 1/4 of the dish. The other 3/4 would b e comprised of flour, starch and baking powder. Yet, if you like fried dough, this is the dish for you. Again, this was very greasy dish which was not totally unexpected. Unlike other versions I've had of this, there was a nice sweet glaze drizzled on top with the toasted almonds. The Beef Chop Suey was probably the healthiest dish of all with broccoli, cauliflower, baby carrots, mushrooms, water chestnuts, cabbage, carrots and beef. This wasn't bad since most of the veggies were still slightly crisp. Furthermore, the beef was tenderized perfectly where it was easy to chew while still retaining some meat texture. The starch-thickened sauce had a nice colour and taste, which also meant no pool of water either. In a predictable shade of radioactive red, the Sweet and Sour Pork was far too sweet. 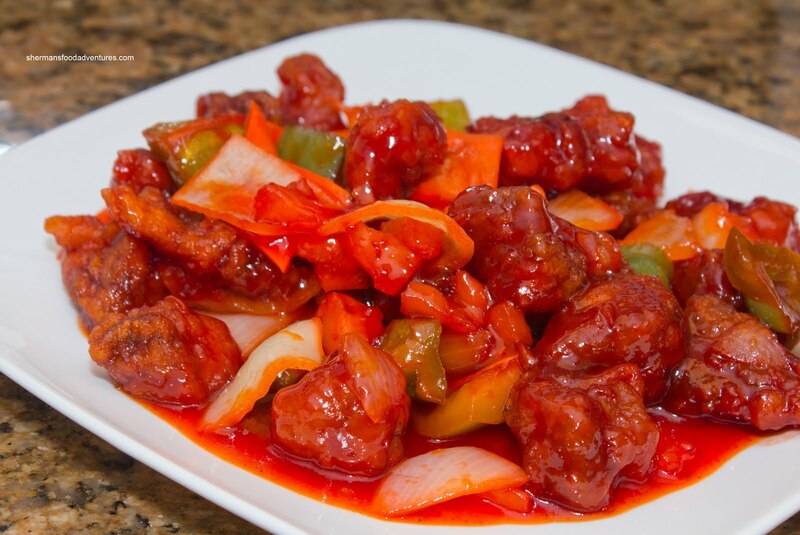 They should've called this super sweet pork instead. With that being said, the pieces of pork were meaty (as evidenced by the dark coloured chunks) and moist. We liked the fact that there was an even ratio of meat to veggies. Sometimes, there are far too much in the way of onions and peppers. 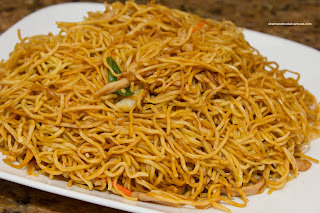 Again, much like the other dishes so far, it was a large portion. 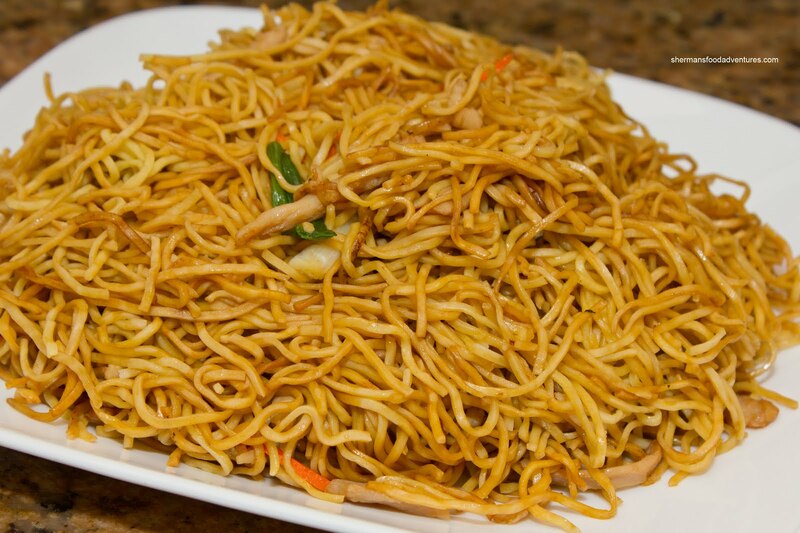 If you guessed there would be Chicken Chow Mein in this dinner set, you would be right. How typical right? Too bad, the execution was far from typical. The darn thing was so dry, it was a bit difficult to swallow. It was mealy and dense in our mouths. Moreover, some of it was not tossed evenly, so there were portions that were not as seasoned. The parts that were seasoned tasted fine with a good balance of sweet and salty. And despite the name, there wasn't really all that much chicken in it. Lastly, there was the BBQ Pork Fried Rice, which they a ssured me didn't have onions. Really... What are those many specks of green in there? Yes, there are peas, I see them. However, look at all those green onions. Well, suffice to say, my son didn't eat any of it. This time, it wasn't the cook's fault, it was the person taking the order. 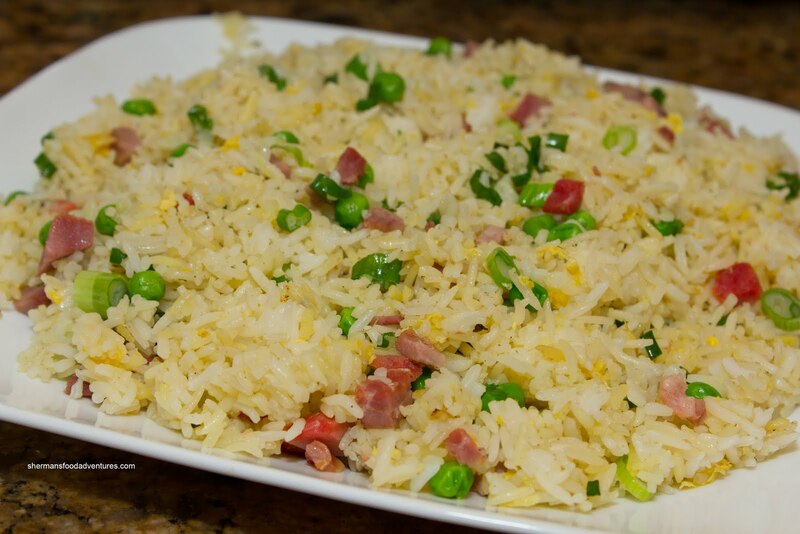 Now, if you ignore the green onion thing for a moment, the rice itself was decent. The rice was dry and chewy (which is a good thing) with enough salt to taste. We liked how it wasn't greasy either. Alright.... This revisit pretty much validates what I thought about the place the first time. I really don't have any regrets then. Sure, it is a family busin ess trying to do their very best, yet is that enough with so much competition these days? Now, if I look at the place from a non-Chinese point-of-view, the food is passable. Considering the prices and the portions sizes, there is good value here. So, if one is not too picky and just wants enough food for the week from one order, then NBWH is okay. $38 ?!? 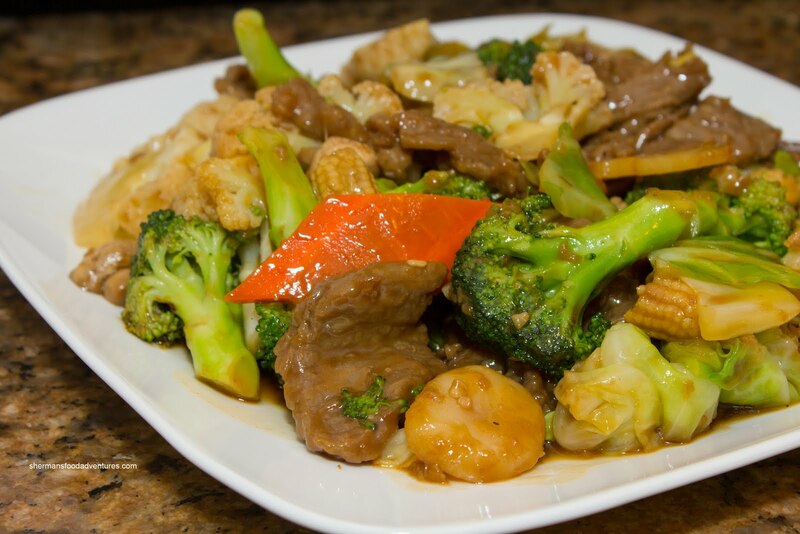 Whoa that to me is barely a $28 deal, where as you know, the fried rice, chow mein and spring rolls are cheap "filler" dishes with a lot more margin on them than the other dishes, in your case the beef & broccoli chop suey and the S&S pork. Oh well, everybody has to pay the rent I guess. And maybe along that part of Hastings east of Willingdon to Barnet, NBWH sort of has a bit of captive market for Chinese food, other than that Capitol Hill Szechuan place (shivers) and Peking Restaurant (double shivers). Actually Harbour Pacific at Willingdon provide decent food (and dim sum, as you've been). @LR HP is not Wah Lun and yah, the food ain't bad there considering the location. I do like Golden Lake on Hastings at Boundary though.